Your Emergency Dentist in Newark Says Avoid Holiday Emergencies! The holiday season is upon us, which means it’s time for caroling, shopping for gifts and eating your favorite foods. 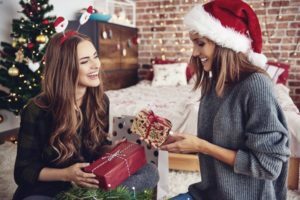 In the midst of all the merriment, though, your emergency dentist in Newark says don’t forget to protect your mouth, teeth and gums from dental trauma. The best way to do that is to implement some simple yet effective strategies. While sweet delights are everywhere during the holiday season, it’s best to set a limit for how much you will consume. That’s because sugar is the food of choice for bacteria. Therefore, when you eat items loaded with this detrimental ingredient, any leftover particles will cause rapid changes in the environment inside your mouth. If you already have dental health issues, the sudden increase in bacteria accumulation could contribute to a painful toothache and can lead to a potential dental emergency. A way to prevent this from happening is to set a sugar budget and stick to it. Another way to prevent bacteria growth that could lead to a dental emergency is to practice excellent oral hygiene, which should include brushing and flossing your teeth at least twice daily. This will help to rid your mouth of the harmful agents that can cause rapid tooth decay and pain. Drinking water after a meal does more than just help with digesting your food. It also aids in bathing your teeth to remove lingering debris that attract bacteria. So along with performing normal oral hygiene, be sure to keep a glass of water handy. Examination – Your mouth, teeth and gums will be thoroughly examined when you visit for preventive care. Additionally, your dentist will take digital X-rays, which provide vivid images of your oral cavity while emitting far less radiation than the traditional method. Professional Cleaning – You’ll also have your teeth cleaned by one of the trained staff members, which will help to remove plaque and tartar that have built-up over time. Oral Cancer Screening – Studies show that instances of oral cancer are on the rise in America; therefore, your dentist performs oral cancer screenings while you visit. If there is evidence of the condition, early detection provides the best way to treat it. This holiday season, your joyous moments don’t have to become nightmares. Preventing a disaster from occurring simply requires a little planning and application to have a happy holiday free of dental emergencies. To schedule a visit with your dentist in Newark before the year ends, reach out today! Dr. Donald Bond earned his Doctor of Dental Surgery degree from the Virginia Commonwealth University School of Dentistry. He helps patients experience the benefits of maintaining excellent oral health at White Clay Dental, and he can be reached for more information through his website. Comments Off on Your Emergency Dentist in Newark Says Avoid Holiday Emergencies!